It’s five years old, planted in deeply amended soil from back when the backhoe worked. I pruned it back a bit a couple of days ago. It grows a little (a very little) every year, never looks actively unhealthy, but this is by far the most enthusiastically it ever flowered. And the newly unhibernated bees certainly find it interesting. All that rain is paying dividends. Keep your fingers crossed for some fruit this year. Can’t tell from the pic how tall that tree is, but the compact shape is interesting. Wondering if the perceived lack of growth might be due actually to passing critters nibbling the branches. All those bees certainly should take care of any pollination concerns. Free, you are absolutely correct! I did not make the connection. 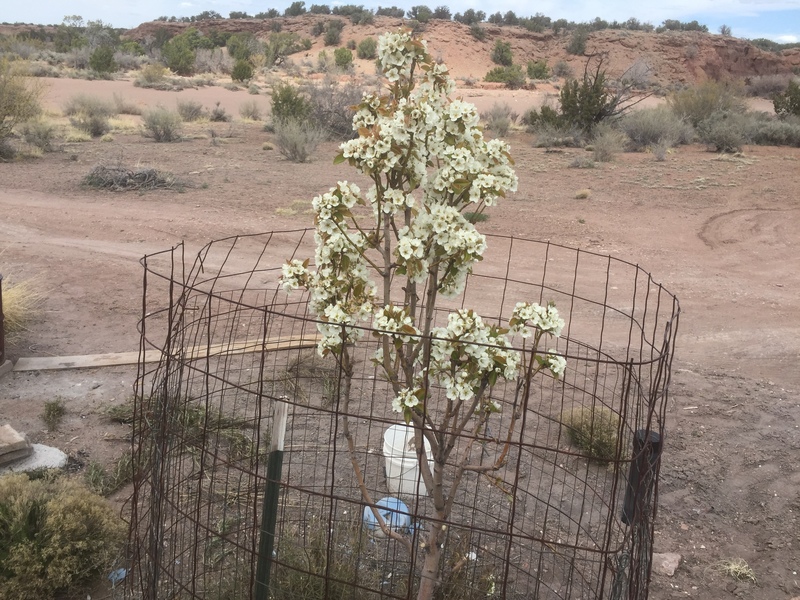 My fruit trees have large 6′ hardware cloth (sheep fencing) cages around them. They also have reinforcing screen around the trunks because of rabbits and porcupines and any critter hungry enough in winter. Yes, the corral must be out far enough to encompass all the branches, with room to spare. And overlap the fencing so it can grow with the branches. Happy to hear about the bees. Robert, yes they do “hibernate” They can’t fly if the temps are in the 40s low 50s. They stay inactive in a cluster in a group in the hive to stay warm and eat their stored honey or added sugar. When the ones on the outside of the cluster get cold they push their way into the middle to get warm creating a new layer on the outside. Mine didn’t quite get the “hibernate” idea and if the temp got into the 50s with full sun would come zooming out of the hive until their wings stopped working, stop flying in mid-air and then go straight down into the snow and die. Zelda: Huh. Thanks for the info. Joel’s readers provide an education. Does the honey from Liberal bees taste different than honey from normal bees? Yeah . . . it’s bitter.